Multilay leather bracelets are all the trend right now! TASBERN's stylish multi-layer leather wrap bracelet with stud beads, a must-have wrist accessories to your outfit. shopping, to a dinner with friends and family or to the party you just want to look fabulous!!! It is a great jewelry piece for someone who perseveranced in high quality pursuit. so no issues putting it on, no help or struggle or frustration when trying to put it on. make you feel different and special. 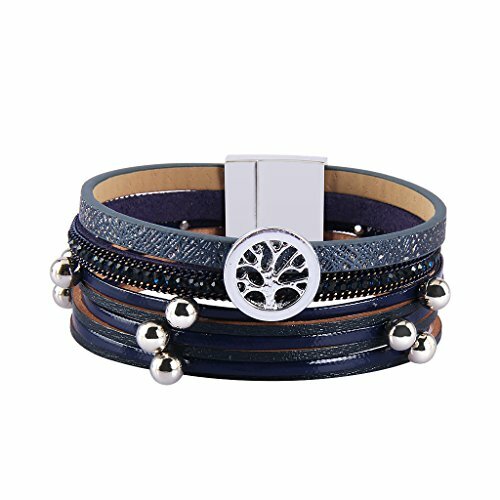 ♥Total length 7.7inch,multi leather stands layering on your hand, fit for almost women or girls' wrists.Please measure before ordering! ♥All the TASBERN leather bracelets are wrapped in an elegant gift box,"add to cart" now and enjoy our 90 days free return or refund guarantee. ♥Your positive feedback is extremely important to us, if have any question, please contact with us freely before you leave a negative feedback. If you have any questions about this product by TASBERN, contact us by completing and submitting the form below. If you are looking for a specif part number, please include it with your message.